Love the Drink. The Name, Not So Much. Let me start this off by saying I mean absolutely no disrespect to Simon Difford. After all, he came up with this drink, which as you can see from the header, I think is pretty damn tasty. Plus, there’s all that assorted other work he does — researching and compiling lists of recipes, developing guides to watering holes around the globe, consulting on pretty much anything related to alcohol — which improves the lives of drink geeks like me to no end. No, my only quibble with Simon — a minor one, I’m sure you’ll agree — is with the name of this drink. Before we get to that, though, let’s take a look at the cocktail. The recipe was conceived, I assume, during a burst of creativity inspired by the launch of St. Germain, the elderflower liqueur that seems destined to remain a staple of every quality bar for decades to come (see my writeup about St. Germain over at Serious Eats). This cocktail starts with the basic 4:1 Plymouth martini — a good first step in anyone’s book — then slides in the St. Germain to give the drink a fruity floral wallop. Then, turning to another ingredient that’s manna to vintage spirits freaks, Difford tips in a little creme de violette, which ups the floral aspect and really pushes the drink onto another plane. Zap it with some orange zest, and you’re set. Of course, you could also look at this as a slight variation on the Attention (aka the Atty, aka the Arsenic and Old Lace), the gin-vermouth-violette-pastis-sometimes orange bitters combo that’s cropped up in a number of places lately, including on Simon’s site (as the Atty) and in the pages of the current issue of Imbibe (as the Attention). Swap the St. Germain for the pastis, use orange zest instead of bitters, tweak the proportions accordingly, and you’re there. Every component of this cocktail has a floral aspect — from the botanicals in the gin and vermouth to the two liqueurs flavored and colored with flower petals, this drink comes straight from the garden. This is all to say that I understand how the name presented itself, and god knows it’s better than most anything I’d be likely to come up with … but still, I just can’t deal with the name. Seeing as how so many bars are discovering St. Germain, and how many should be beating down their distributor’s doors to get a bottle of the Rothman & Winter Creme de Violette (currently available in New York, and very soon in California), I may actually have the opportunity to order one of these in a public establishment. Should that be the case, I may need to just have the recipe printed up on cards I can hand to the bartender. “What’s the name?” they’ll ask. “Ummm….” I’ll respond. Stir well with ice, strain into chilled cocktail glass. Garnish with strip of orange zest. 14 Responses to Love the Drink. The Name, Not So Much. Supposedly. I still haven’t found it yet. I haven’t quite gotten to the point of calling every NYC retailer on the distribution page of the Haus Alpenz website, but I’m getting close. I have searched and browsed the websites for all of them, and so far no luck. The name of this has definently brightened up my day. News has it that we in New Zealand will be able to get our hands on some St Germain relativley soon, and I will put this on my list in homage. Same here, it’s maddening really. Though a trip to Japan for Hermes would be awfully fun. I’ll try this as soon as possible though. Huh, interesting, I’ve been thinking about this too. 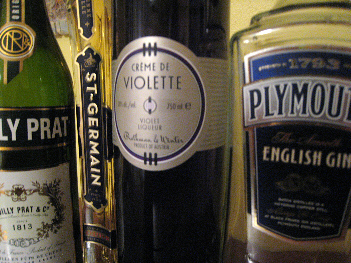 Though, for some flower symmetry I was planning on swapping the violette for the elderflower, and leaving the absinthe in. Must give that a try. Add ingredients to mixing glass, stir, garnish with twist of lemon. This is probably the winner of our many experiments with St. Germain. The somewhat bitter Amaro is the only addition that we could find that was able to cut some of the sweetness, but still result in a very drinkable and classy cocktail for almost any drinker. Oops. I should have mentioned that we tried a lot of drinks with the St. Germain, and The Continental was the unqualified winner. There was another one with Chartreuse that was pretty good, but this one seemed to really catch everyone’s attention. I just made a Corpse Reviver #2 and added 1 Teaspoon of St. Germain…not bad at all…. Loved this drink; a staple since St. Germain became available in my area. I tried it with Bombaby Sapphire (thinking it’s softness would compliment the cocktail) but to no avail. Plymouth is THE choice, hands down. A great use for both St. Germain and creme de violette. Hi, I’m new to the hunt; just starting to get interested in classic cocktails. What was that about finding creme de violette in CA? Where, if anyone knows? I go to the local stores and they have no idea what I am talking about. Googling is almost as useless, but I did find your blog entry that way. Also, what if we don’t like gin, can we substitute vodka in your recipe, or would that ruin it? Regular Bombay works in place of Plymouth, but as noted above, the Saphire does not have enough flavor.